This time of year, I love being home and in cozy, comfortable pieces. My hubby is the same way and we love to buy each other (and the kids!) a new pj set each year for Christmas. 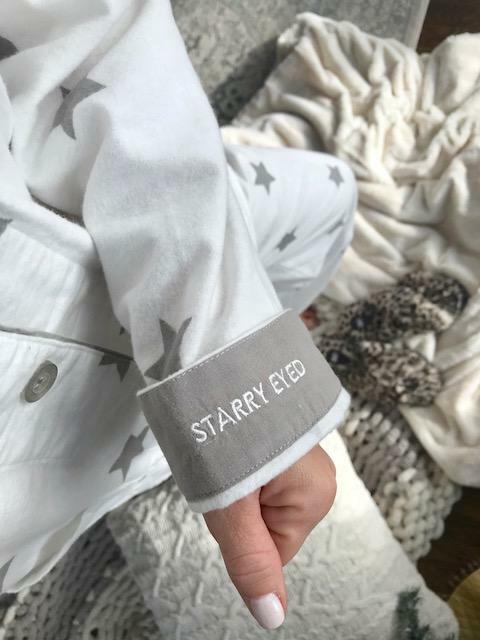 This year, I broke down early and bought these adorable star print pajamas from Nordstrom. It is the place to go for unique, high-quality, yet affordable pieces. I can remember when I was younger, my mom would come home from work, take off her shoes but leave her work clothes on including tights and make dinner for us, help us with homework, etc. Not me - getting into cozy, comfy clothes is the first thing I do when I get home from work. What about you? Are you all about the cozy wear? I love that Nordstrom has such a variety of loungewear and pajamas! From easy joggers to pajama sets - there is something cozy for everyone! Make sure you scroll down to the bottom as I'm sharing my favorite picks for the whole family. They would make fun gift ideas that will be a hit all Winter long. A big Thank You to Nordstrom and RewardStyle for sponsoring this post. All opinions are my own.